Hear ye, hear ye... All hopheads shall herewith rejoice! 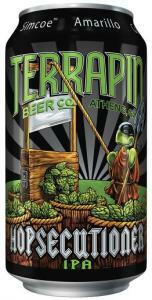 Terrapin hath recruited ye old HOPSECUTIONER to execute the exact hop profile for this killer IPA. You may lose your hophead over this one!